Messy Church started in an Anglican church near Portsmouth, UK, in 2004 and has grown into an international movement operating across a wide range of Christian denominations and traditions. It became a part of The Bible Reading Fellowship (BRF) in 2006 with publication of the first Messy Church book by founder Lucy Moore. Messy Church enables people of all ages to belong to Christ together through their local church. It is a way of being church which is a particularly suited to families, but welcoming to all. It meets at a time and on a day that suits local families and is particularly welcoming to people who have never belonged to a church before. Today, Messy Church has spread to at least over 4000 registered Messy Churches in 30 different countries. Over 500,000 throughout the world worship monthly at Messy Church. Bible Reading Fellowship (BRF) is a Christian charity based in Oxfordshire, UK and is the home of Messy Church. BRF supports resources and enables the work of Messy Church. BRF is passionate about making a difference through the Christian faith. For more information on the work of BRF, click here. What is the relationship between Messy Church USA and the International Messy Church Movement? 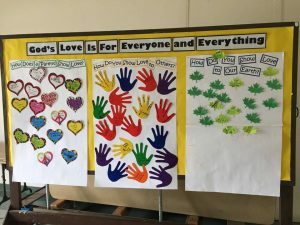 As Messy Church has spread throughout the globe, Bible Reading Fellowship (BRF), the home of international Messy Church in UK has entered into relationships with a variety of organizations in different countries to serve as the ‘home’ for Messy Church in their respective country.